Provide comfort for the family of Audrey Schicantek with a meaningful gesture of sympathy. 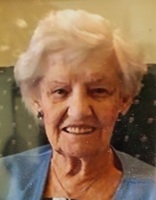 (nee Klatt) Born to Eternal Life January 26, 2019, age 98 years. Beloved wife of the late John. Loving mother of Karen, the late Dale, Glen (Becky) and Wayne (Peggy) Schicantek. Proud grandma of Jennifer (Scott), Katy, Christopher (Molly), Jason, Ben, Becky and Amanda. Great-grandma of Hunter, Fisher and Dominic. Further survived by nieces, nephews, other relatives and friends. A visitation will be held on Thurs. Jan. 31, from 4-6 PM at the Schramka-Borgwardt Funeral Home, 11030 W. Forest Home Ave., Hales Corners, with a prayer service at 6PM. A second visitation will be held Fri. Feb. 1, from 10 AM until the time of the Funeral Service at 11AM at Apostle Presbyterian Church, (1509 S. 76th St. West Allis, WI 53214). Burial will immediately follow at Highland Memorial Park. In lieu of flowers, memorial to the church in Audrey’s name would be appreciated. (see address above). To send flowers in memory of Audrey G. Schicantek, please visit our Heartfelt Sympathies Store.